Here are some more! Just click on the attachments for the images! 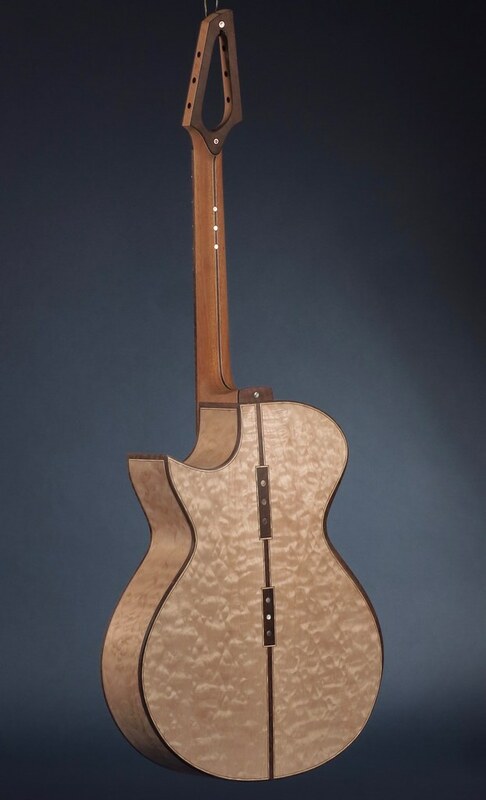 A quick shot of our first guitar slated for B.I.G. Went out to our finish ace yesterday, and we're pretty hopeful about making it in time. 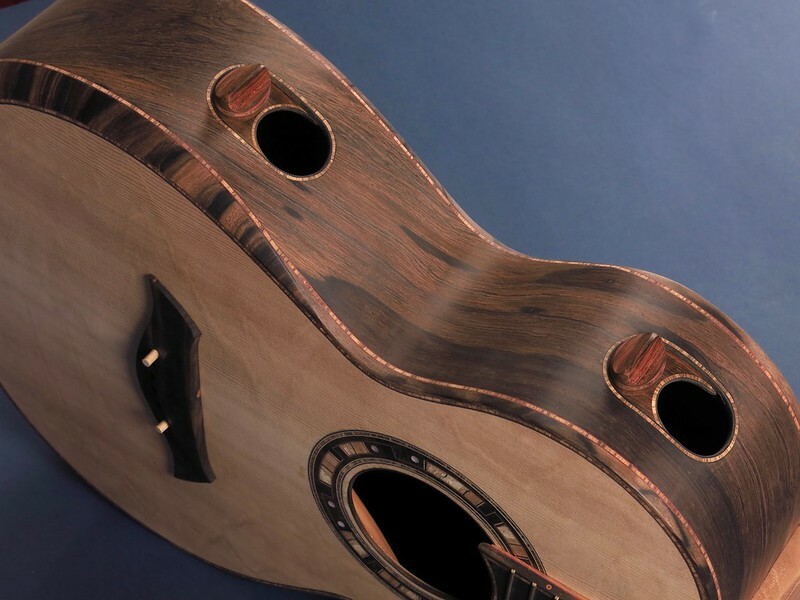 This 00 cutaway has a Carpathian spruce top, with really curly Honduran Mahogany back, sides and neck. Bindings are Amazuran rosewood. (Rare cross between Amazon and Honduran. Actually, sold as Honduran, looks a bit more like Amazon, would take a forest lab expert to settle the debate.) Headplate and bridge are Brazilian, and we're certain on that. If you are coming to BIG, keep your fingers crossed for this guy's timely completion! Here is another guitar that I’m working on for B.I.G. It’s my Solis model (auditorium/0000-size with a 16” lower bout). 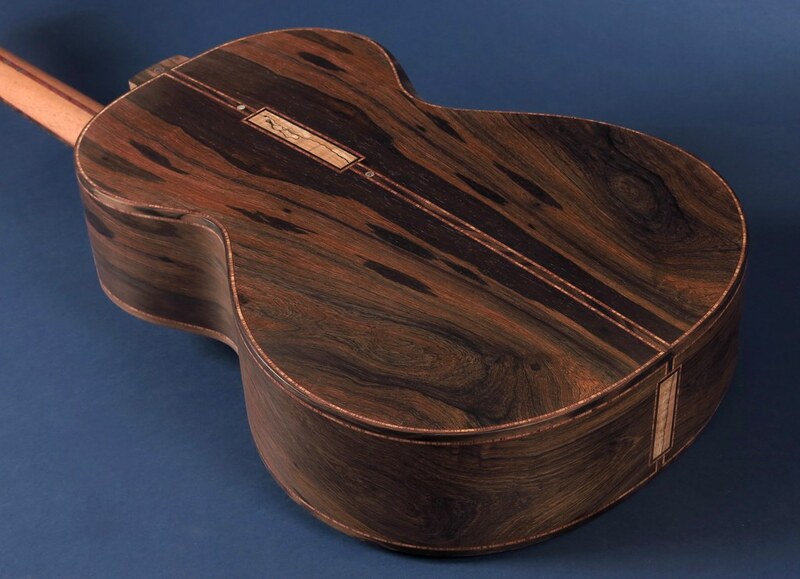 It has Master-grade Sitka over Cocobolo, with flamed Pyinma purflings, Ebony bindings and rust veneer lines. The rosette is Pyinma burl with flamed Pyinma purfling. Hi, Tom, and everybody else groovin' on this thread. I've been a bit of a hermit lately, submerged pretty deep in various projects, getting ready for this show. 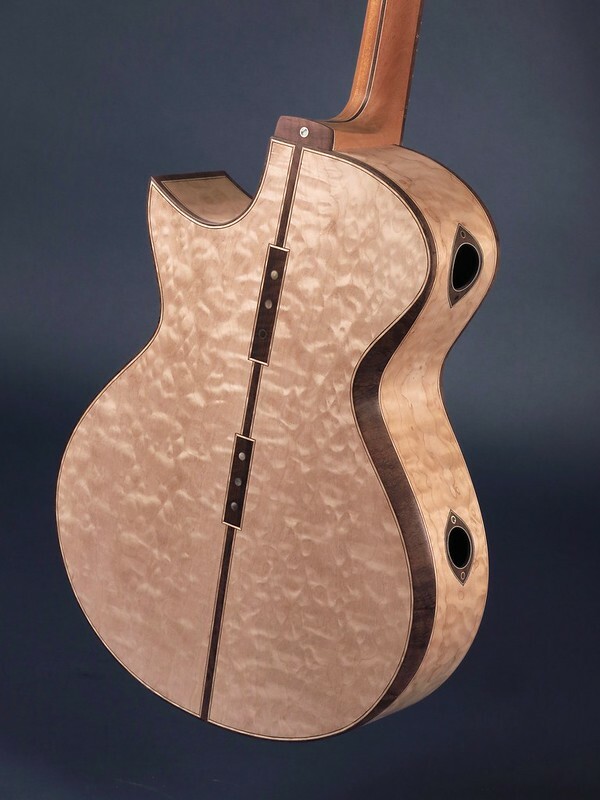 I think it's time to post some photos of a couple of guitars I'll be showing at the Bowersox Invitational. Just so you guys know I haven't been slacking off (at least not too much). The photos are pre-finish, which I like to refer to as "tasteful nudes". Both of the guitars I'm showing here are now in the final round of lacquer spraying, so I'm feeling a small measure of relief, with enough time to get these done and dialed in before the last minute. 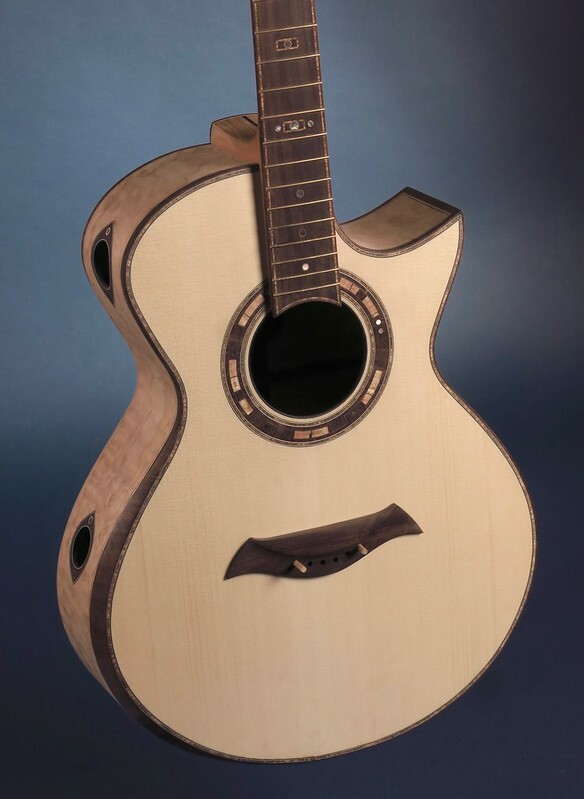 First, a Quilted Maple/German Spruce Eclipse OM guitar. The bindings, bevels, bridge, fingerboard, and headstock plates are all Mexican Royal Ebony, aka Katalox. 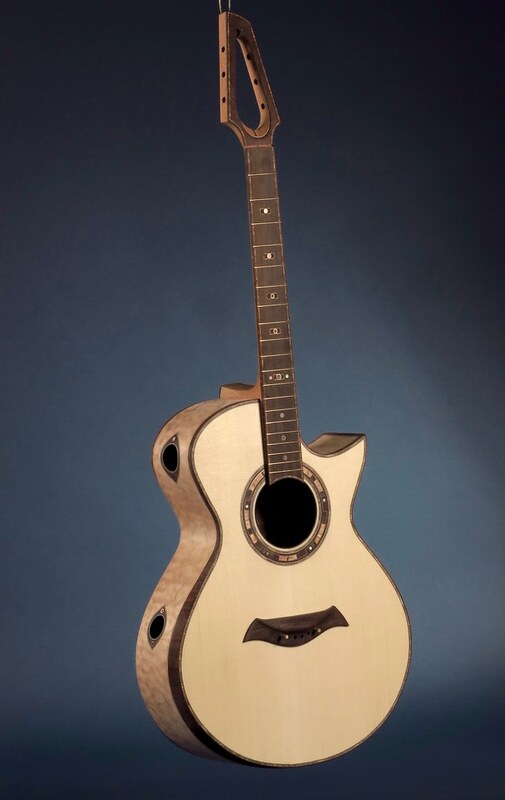 It's a 25.5" scale guitar, thirteen frets-to-body, with arm and rib bevels, dual side sound ports, and an Omega open headstock, which will be sporting a set of Schaller Grand Tune tuners. I was actually going to give this guitar a transparent blue with black shading paint job, but decided against it after I sprayed the first base coats. The quilt figure on the back and sides is amazing, and the Maple has a reddish flash at some reflective angles, so I decided to keep it natural. Why mess with that! Wait till you see that quilt under lacquer! Next is a pretty high-end version of my Zephyr 00 model- a little guitar that punches above its weight class. 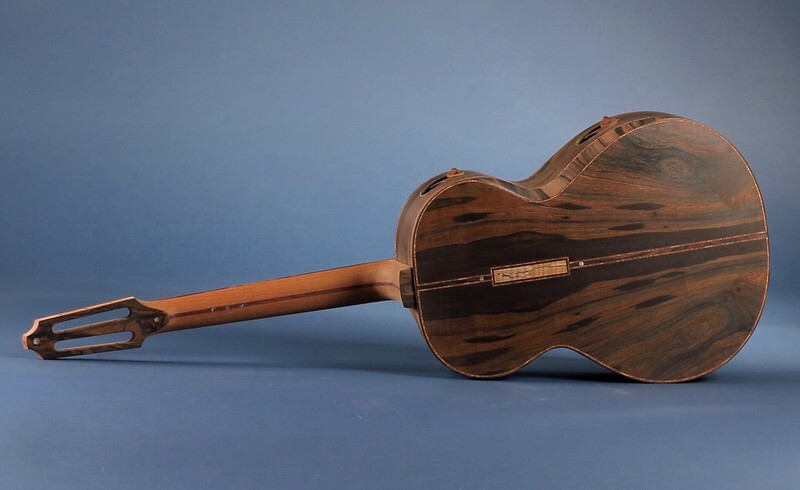 This one has Brazilian Rosewood back and sides, a Bearclaw Sitka top from Alaska, and a lot of Macassar Ebony trim. I decided to give it the Pogoda style slotted headstock, which will also be fitted with some exotic looking Schaller Grand Tune tuners. 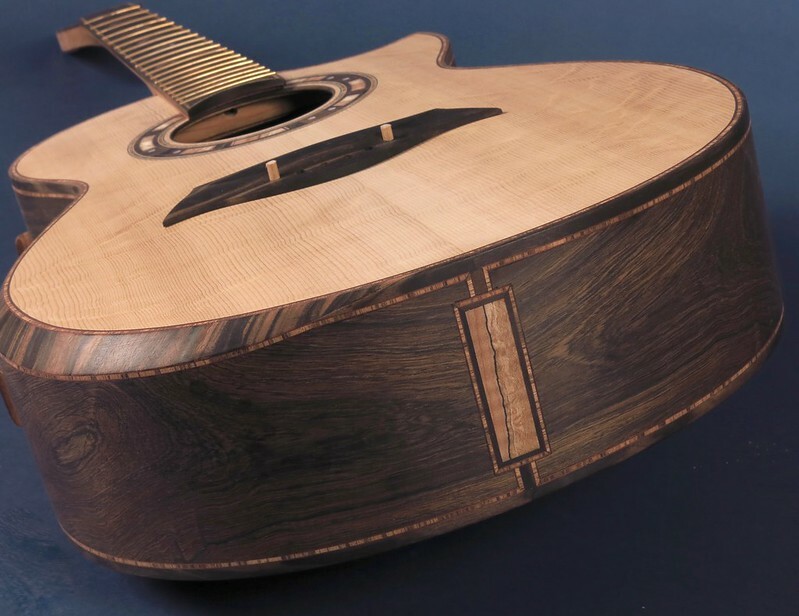 I decided to give this one a scoop-cutaway.This guitar is a 25" scale, and will be optimized for fingerstyle and pick-style, if I have anything to say about it. I used cross-grain Zebra Wood with thin red veneer lines for the purflings. Again, arm and rib bevels, and dual side sound ports. 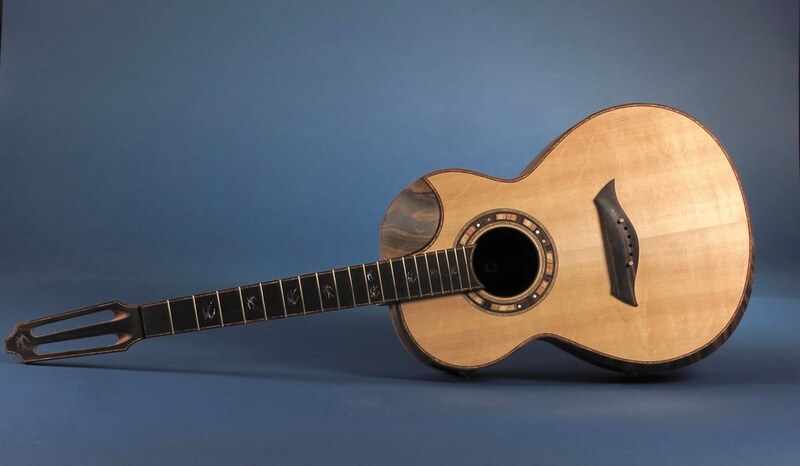 The ports on this guitar both have sliders, so they can be played open or closed. It's amazing how the pitch of the sound box tap tone changes, depending on the sound ports being open or closed. I expect this guitar to be a very versatile instrument that will offer a lot of options for recording with microphones. The Brazilian Zephyr also comes with a custom Hoffee carbon fiber flight case. Thanks for looking, everyone! I'll post more photos of these guitars before the show, when they are all done and ready for prime time. Now, I gotta go shoot the final coats of lacquer on these babies. Don't you know it, LOL. This weekend is going to be setting me back a bit, but it could end up setting me back quite a bit with the guitars these guys are bringing. My only hope is I am too busy running around to find my check book or I might be in big trouble!!!! Can't wait to see you in Texas Mike!!! I am so pleased you are coming! Totally thrilled to be coming, Tom. More fun with the Kalamazoo Gal-made, went-to-WWII guitar. Rosanne Cash will be stopping by to play it before B.I.G. There will be loads of great DNA on the instrument. To minimize your contribution, please wear pants while playing it. Uh, a shirt, too, please. Steve, you may be great at making guitars, but you stink at this business thing...you don't send people to Joel when they love your guitars HAHAHA...I think we better have a talk at B.I.G., just you and I my friend LOL! This is so exciting. I can't wait to play this guitar with all the famous folks that have played it already and for all the places it has been! And then to think, my name will be added to the list which has got to make the guitar even more of a celebrity!!!! Don't these guys work out of the same workshop, or am I mixing them up with other people?? No you are correct, they share a shop, but build under their own banners...just an attempt at humor on my part. Well - I know y’all are in for a real treat with the 0’s that Bruce built. We had a break in the rain here, and Bruce decided to take a little ride down to Berkeley and brought them along, and I had a little chance to try them both out. Both are spectacular - the mahogany has a really lovely voice, and had been the one I’d been kinda lusting over, as my favorite personal guitar is a mahogany mini-D Bruce built some years ago, and this little 0 did not disappoint. I really loved it, and might have thought that it would be impossible to beat, but then I tried the pernambuco, and wow!. It has a richer, more multi-dimensional voice that pulls you in as you play. Better is not really the adjective - more a question of style, aesthetics, and preference, and I would need a fair bit more time with both to make a choice. More than a few Santa Cruz’s, a few Sexauers, a Patterson, a Larrivee, a Lynch, a Cumpiano, and a Klepper!! I do wish Tad were coming to B.I.G., I could just play guitar the whole time and let him do the talking. It is great to have good friends. I wish he were coming to, I did invite him! Kathy and I are honored to have you and your guitars in our home for the inaugural B.I.G. with or without Tadol! There should be plenty of time for talking and playing!!! !